Pure class and elegance underscored by solid steel. Betty Ford truly epitomized the great T.R. 's words of "walk softly, and carry a big stick". Betty Ford not only fought for women's rights, but she made it possible to openly discuss a myriad of issues that no one wanted to voice. She taught me that the best leadership is by example, if you want to get anything done you better be willing to get your own hands dirty, and that compassion speaks volumes. 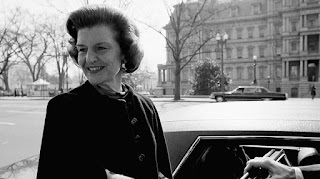 Betty Ford owned her weaknesses which was one of her greatest strengths. At a time when addiction was hushed up, she came forward and sought help. Betty Ford realized that shame cast a shadow and prevented others from seeking help. In her founding of the Betty Ford Center, she brought a rather large spotlight onto addiction and saved countless lives through her actions. Ford demonstrated endless compassion for those who sought help but also demanded that any resident of the Center contributed sweat equity toward its upkeep (as she did herself). Betty Ford was audacious in her own quiet way. She spoke out about many topics and ensured through her example that no subject was taboo if it meant supporting those who suffered at the hands of illness, addiction, neglect, or abuse. Betty Ford was a force to be reckoned with as she tirelessly fought for women's rights. She built consensus among disparate groups through her charm, common sense, and her ability to truly listen and find common ground. She never sought the spotlight for her own glorification, but rather used her fame to bring attention and support to where it was needed. When my thirteen-year-old twin daughters look for an example of how to live their lives, I point to Betty Ford. I always tell them not to look for mentors who rise when life is easy but rather to look to those folks who shine during their darkest hours. Thank you, Betty Ford.